Tomorrow, Tuesday, August 16 is a big day – all the fraternity property will be moved back from storage. 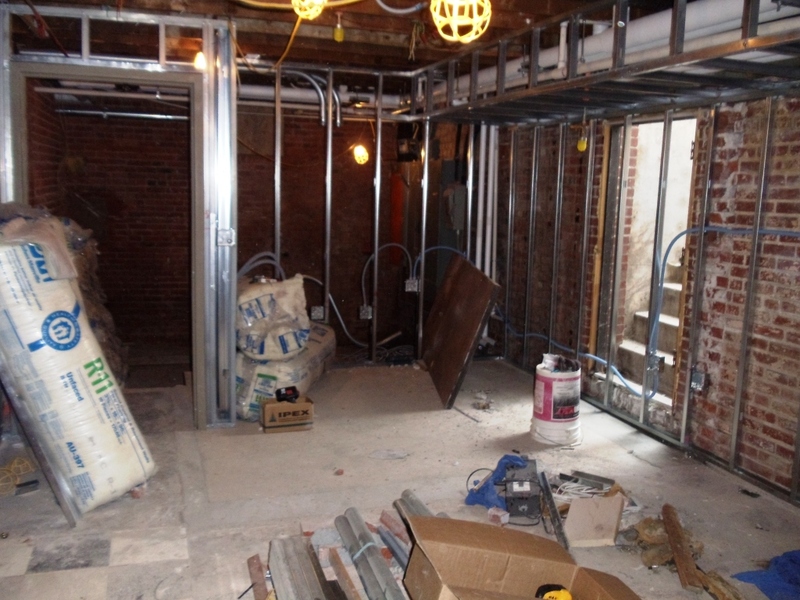 Due to the extent of the renovation, the chapter had to store its property off-site. We kept the large round coffee table, grandfather clock, piano, trophy case, library table, conference table, milk machine, Hobart mixer, and freezer – along with all the composites, chapter records, supplies, etc. 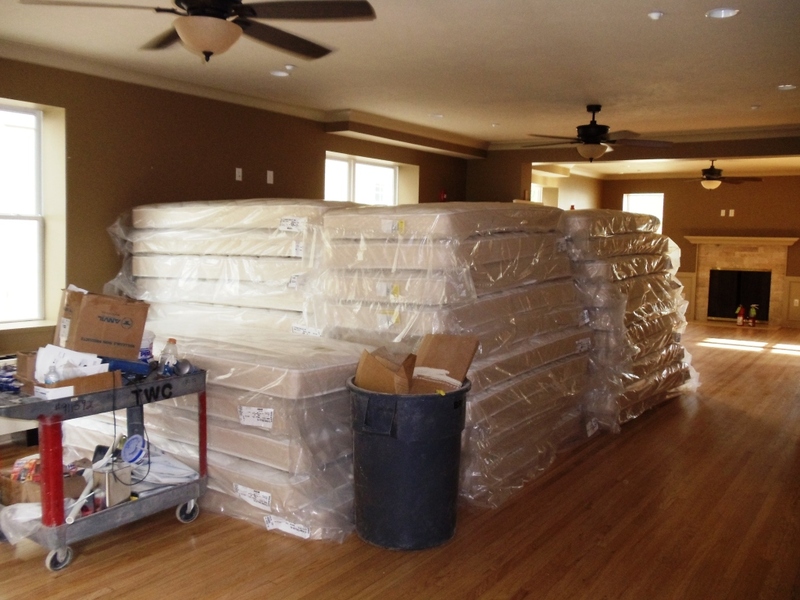 Today, a few deliveries were made – including the washers and dryers for second and third floor, 65 mattresses and rest of the dorm furniture (bunk beds, dresser, wardrobes and desk). Tomorrow the new living room furniture and copy/scan/print machine will arrive. The house corporation also met with the locksmith today — the chapter will be installing a master key system for all interior doors and a card system at all entry points. This should help manage the who has access to the chapter house. Thank you to all the graduate brothers who have donated to the project. 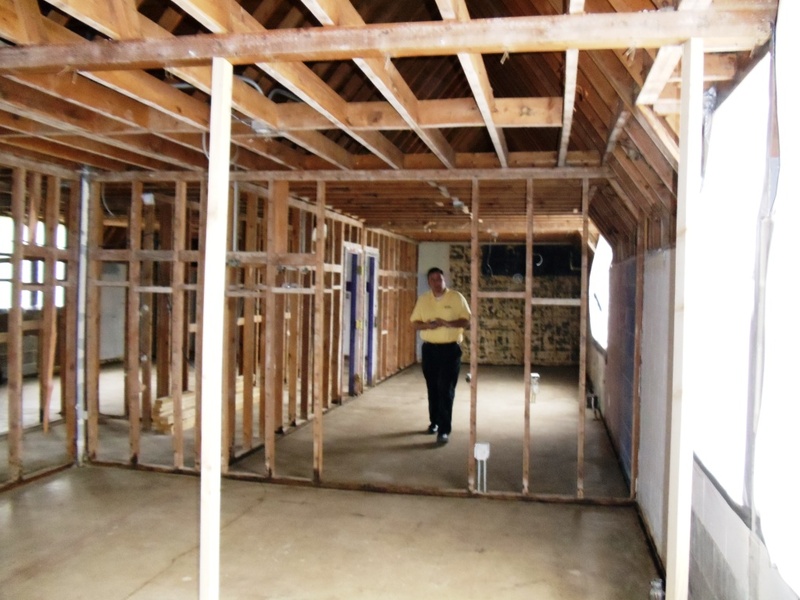 Our young PhiGams are going to have a safe, modern chapter house to call home during their college years. If you haven’t donated yet – we can still need your help! Visit the How to Donate tab for more information. The living room is ready for furniture — minus the fire door on the right (which will be installed upstairs tomorrow). The dining room floor was sealed and waxed today. Chandeliers were hung late last week. 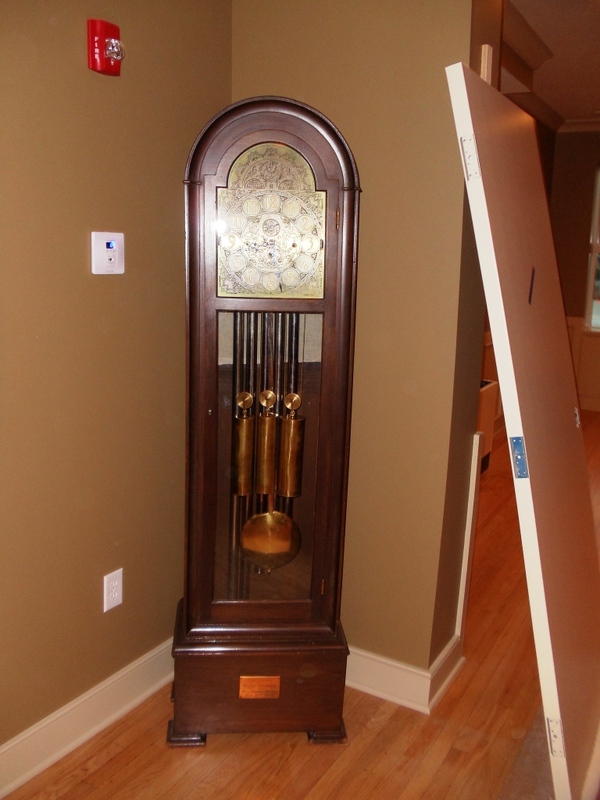 The first piece of furniture was brought back to the chapter house last weekend — the grandfather clock. It has been in foster care for the past few years as the exact date of construction was not known. It is working properly and keeps excellent time. The small white box to the left is the carbon monoxide detectors that are now required to be approved university housing. 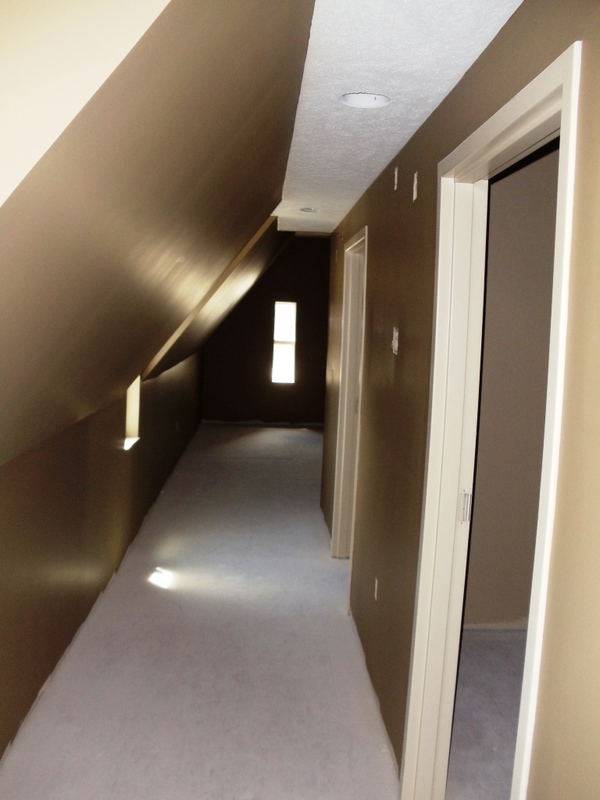 Doors, carpet, trim – oh my! 14 days left! 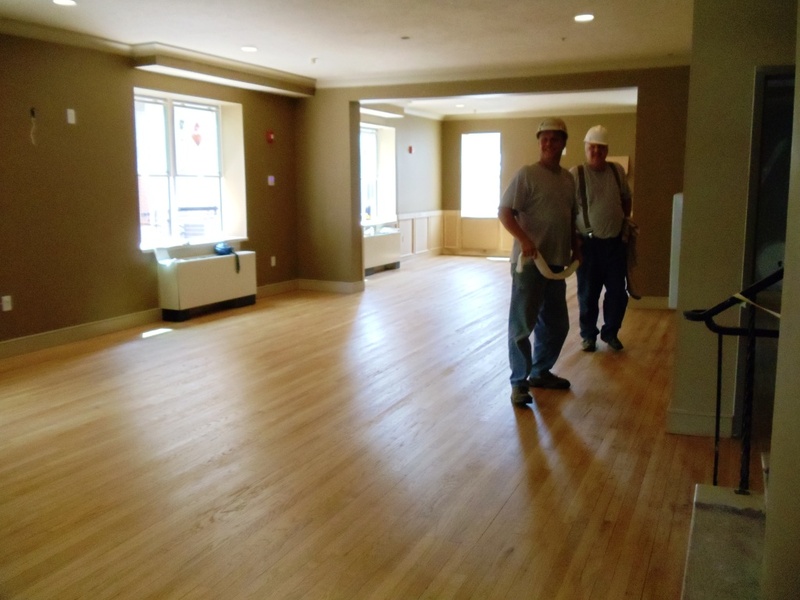 Carpet, doors, and trim – the chapter house is starting to look like a home. The next two weeks are going to be a flurry of activity to finish by August 17. 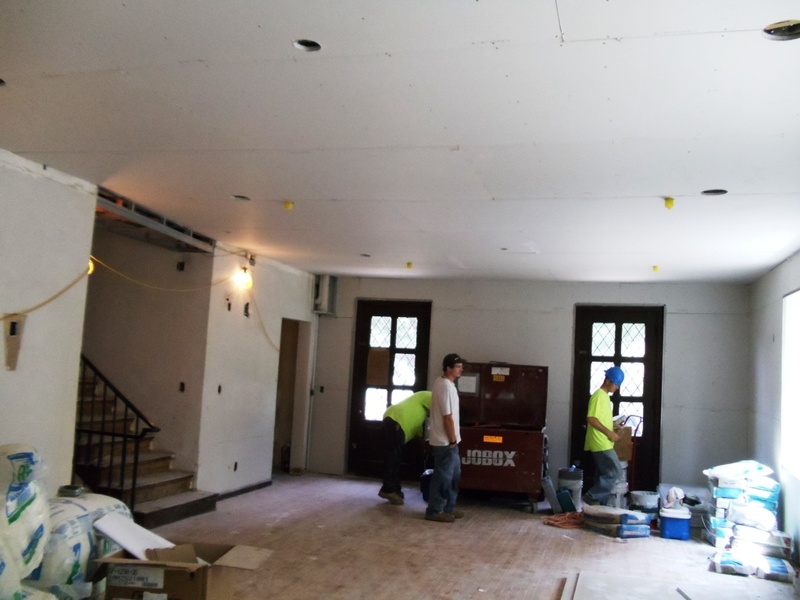 This week carpet is being installed in the hallways of the 1931 building and in the rooms of the 1964 addition. 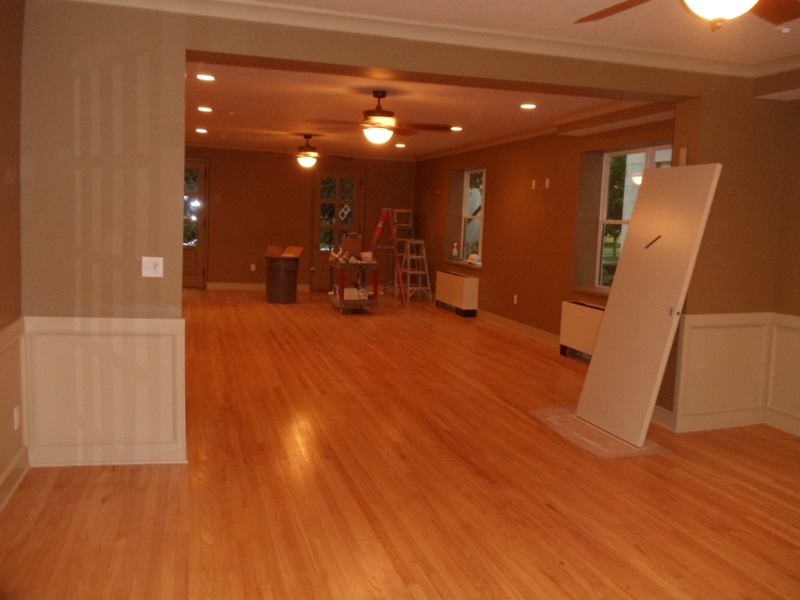 The living room and housemother’s floors are being sanded and finished. New solid core doors are being installed throughout the house. A master-key system will be installed that will allow the house corporation to have a single key that will open all doors. Each student’s key will unlock their study and assigned sleeping room door. Next week’s highlights include firing up the air conditioner for the first time, installing the wireless internet system and rest of the finishes. FIJI is hosting all the UNL fraternity and sorority house corporations next week during the greek house tour. If you haven’t done so already — mark your calendar and plan to attend Pig Dinner on Friday, October 7, 2011. The chapter house dedication ceremony will take place on Friday at 4.30 p.m. with the 106th Norris Pig Dinner starting at 7. This year’s keynote address will be by the Honorable J. Robert Kerrey (Nebraska 1965), Former United States Senator and Governor of Nebraska. Painting starts in the kitchen. The kitchen will get a new stove and refrigerator. 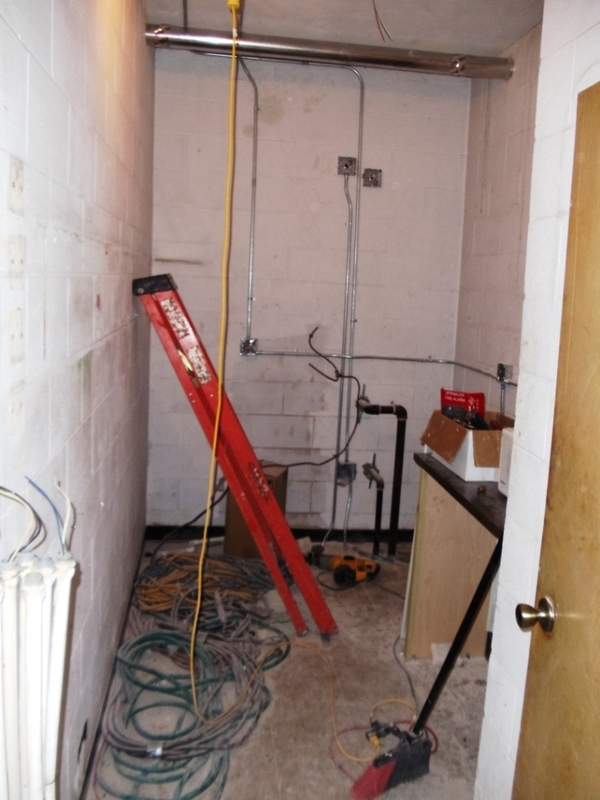 The old ice room will house a new residential refrigerator, microwave and new ice machine. Late plates and extra food will be stored in this room for guys to have access to in the evening. The kitchen will remained locked when the cook is not present. 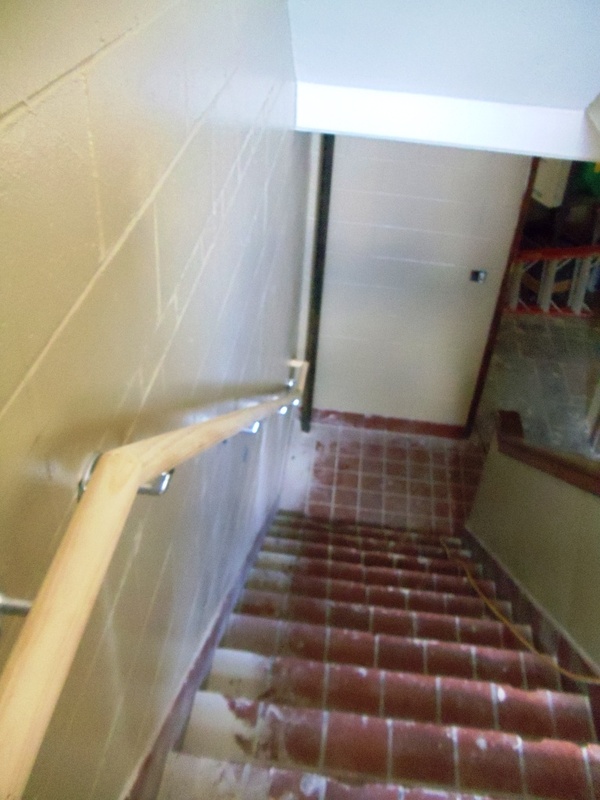 The 1964 stairwell has been painted and new railing installed. Code requires new railings in both the 1964 and 1931 stairwells. New hallway carpet in the 3rd floor of the 1931 building. New doors have been installed. 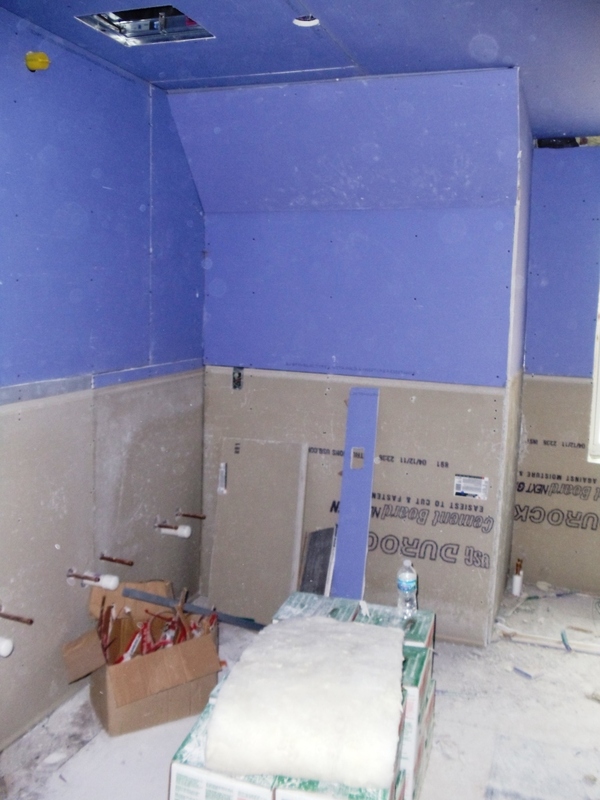 The 3rd floor bathroom in the 1964 addition is ready for its final finishes. New main electrical service panel — this feeds each of the subpanels on each floor. All of the heating and cooling plumbing was redone. The boiler room ceiling is almost fully covered in insulted pipes. The painters have finished 2nd, 3rd, and 4th floors of the 1931 building. The camera is not doing the colors justice – the hallways and individual sleeping rooms are light beige with the study rooms a light brown. Carpet should be installed next week. 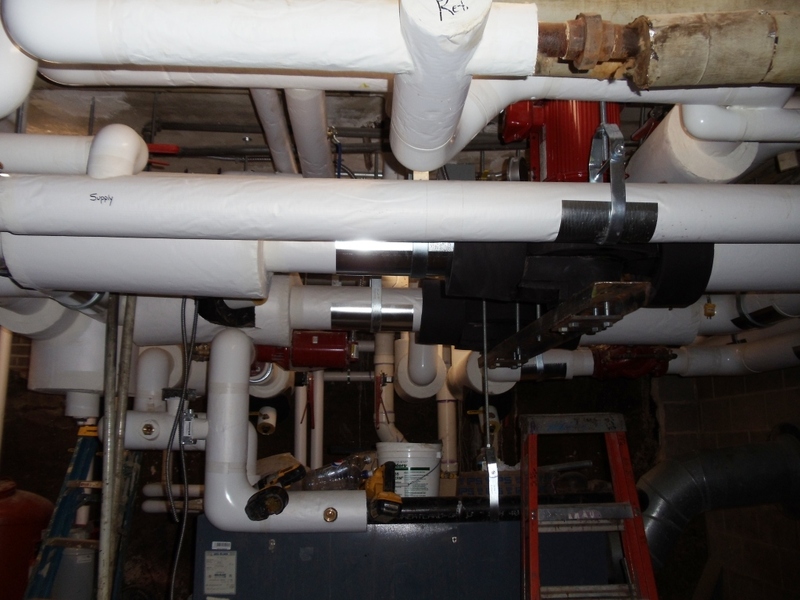 Mechanical and electrical rough-ins continue in the 1964 addition. 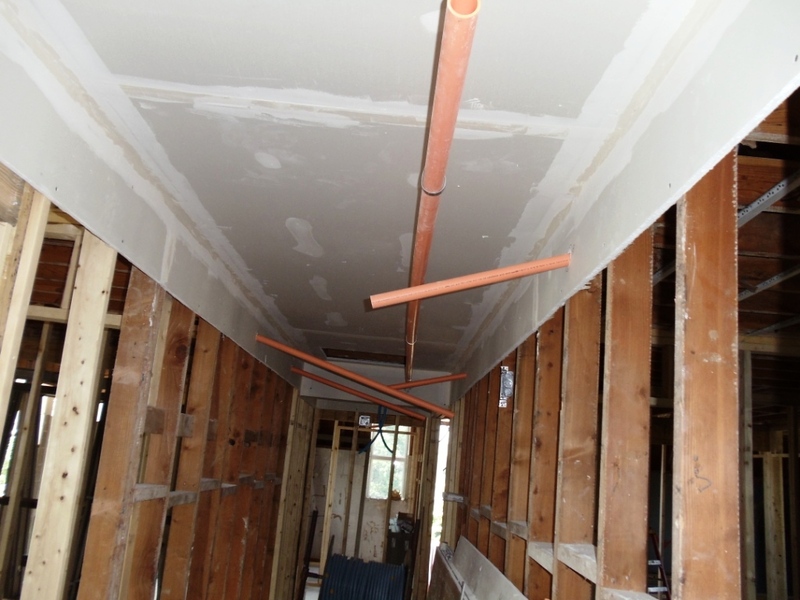 Fire sprinklers are being installed in the entire building. Lincoln Electric System buried the power line last week. While it is nice to have this line concealed, the downside is the back lot took a beating. Luckily, as they dug a trench from the pole to the back of the 1931 building, no surprises were found (such as a buried fuel tank). 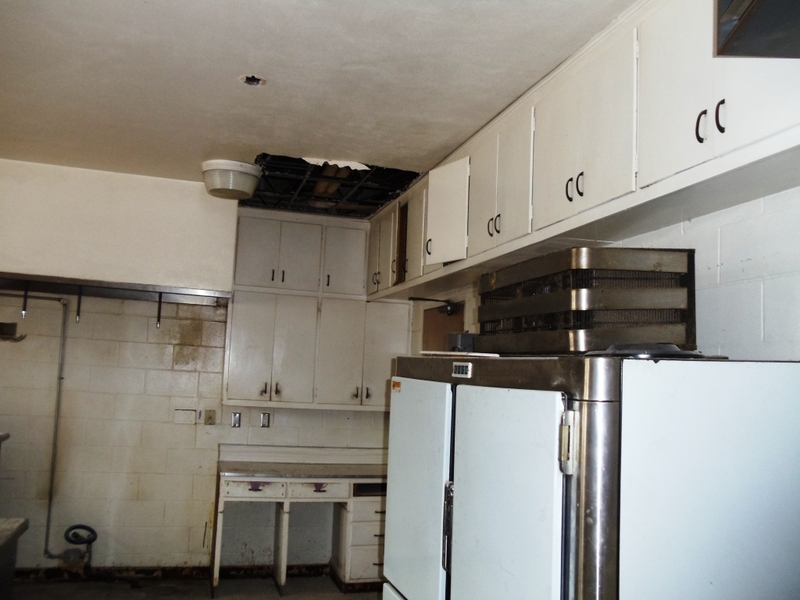 A new stove and refrigerator has been ordered to replace the 1964 appliances. 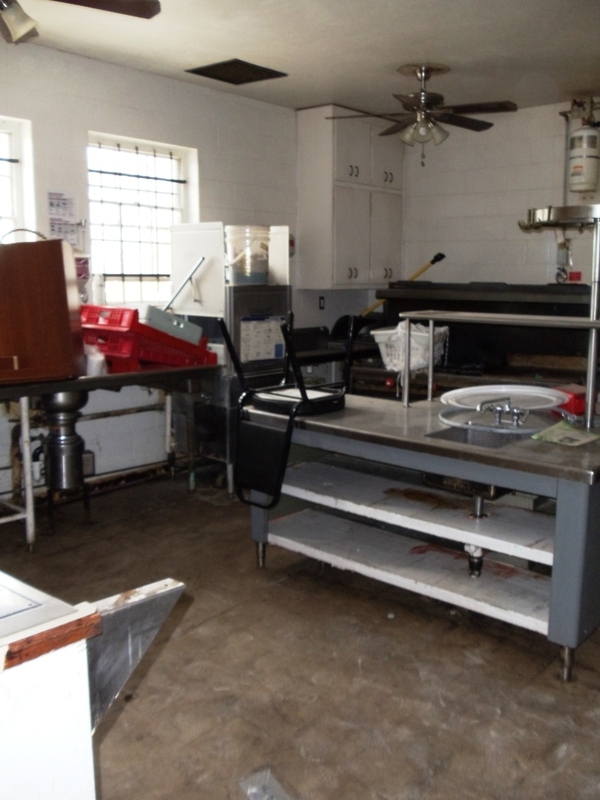 The fraternity’s freezer is relatively new and will be reused. The board was able to contract with Cornhusker State Industries to custom build dorm room furniture (will be installed in the completed rooms next week). 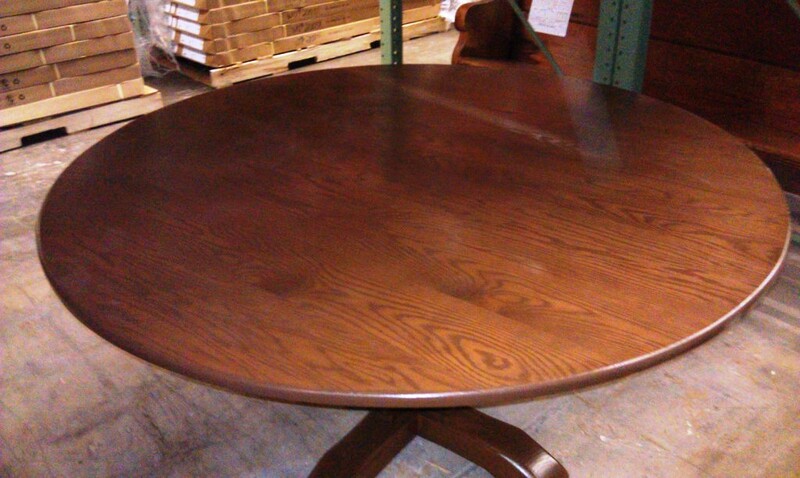 CSI also refinished the dining room tables and a few other wood pieces from the chapter house. The dining room tables look brand new and are ready for another 50 years of FIJIs celebrating lunch and dinner together. 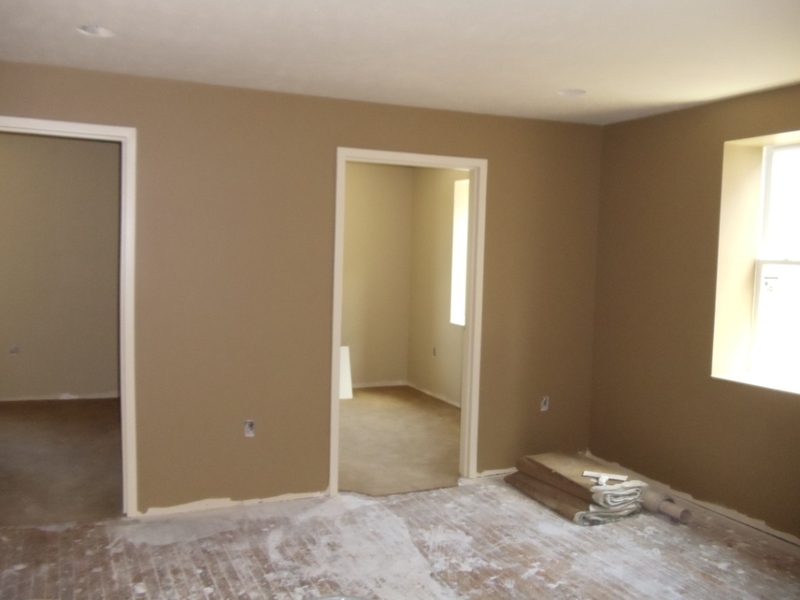 Room 200 — the study room and sleeping room has been painted. Room 401 (old 4 south) — the hallway that leads to the main study room. The sleeping rooms are off to the right. 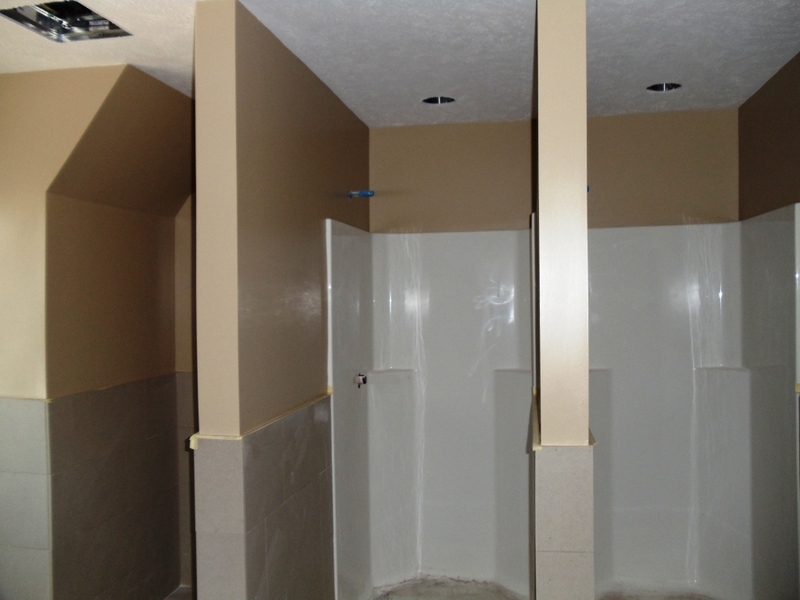 The bathroom on the 1931 building — 3rd floor — ready for final finishes. Mechanical and electrical rough-ins. 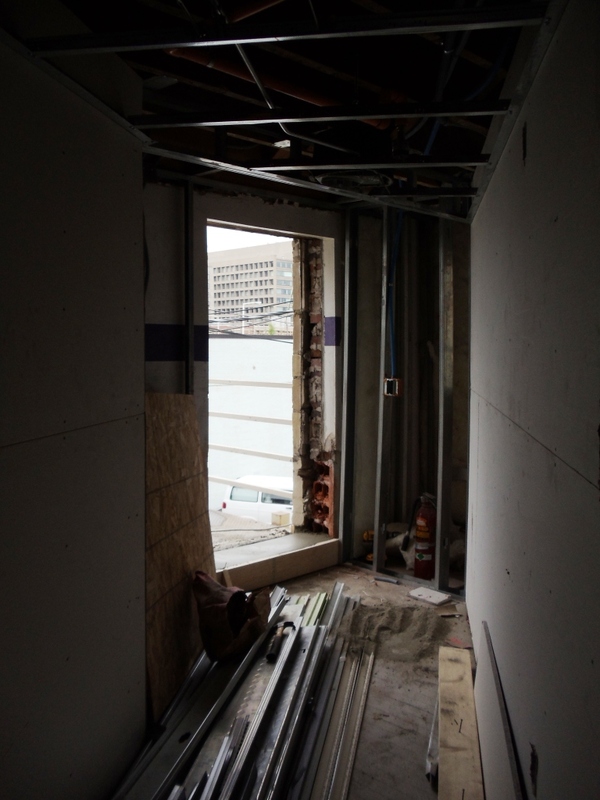 Photo is taken on 2nd floor — looking west into room 210 (old 212 and cleaning closet). 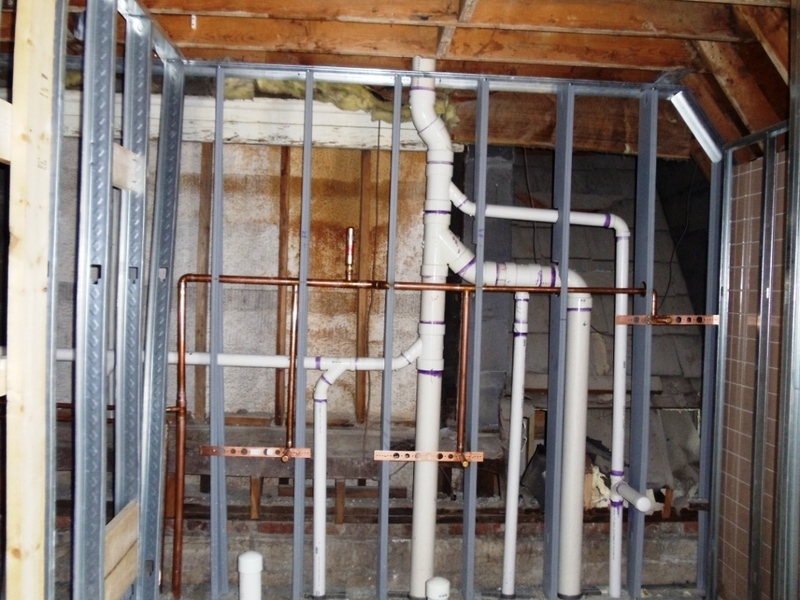 3rd floor bathroom, 1964 addition — plumbing rough-ins are installed. 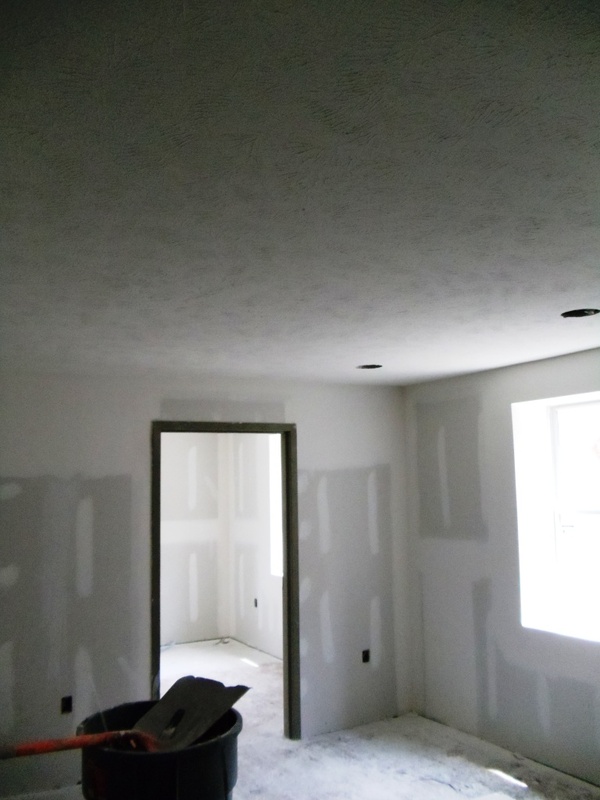 Drywall should start soon. Fire sprinkler rough-ins on the 3rd floor, 1964 addition. 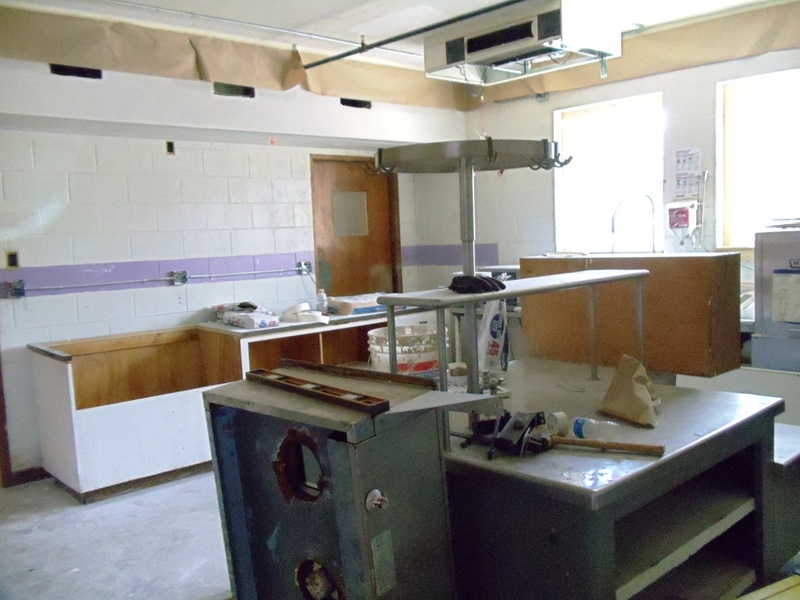 The 1964 appliances have been removed and new ones are on order. The kitchen layout will remain relatively the same. 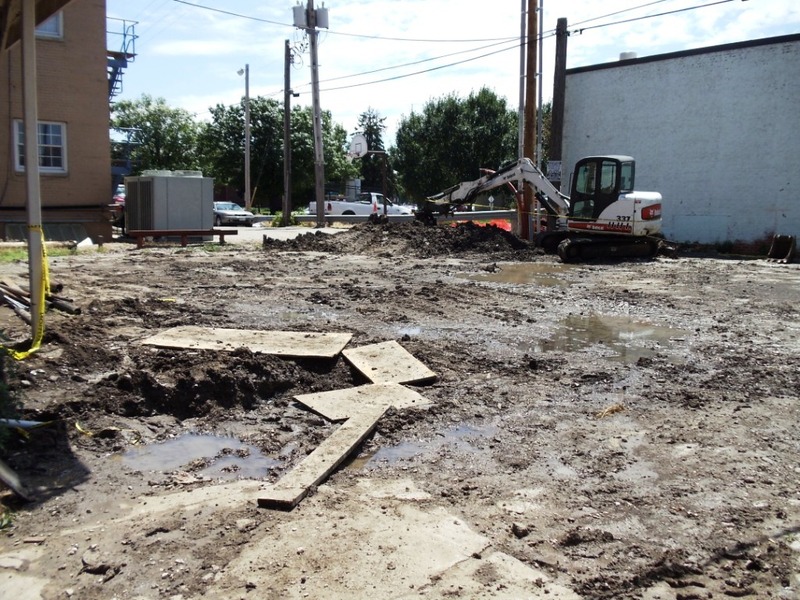 The poor back lot has seen better days — LES dug a trench from the pole in the middle of the photo to the back of the 1931 building to install a new power main. Finish work started on the “old” side of the build – old is in quotes, because after this project is compete both the old, 1931 building, and the “new,” 1964 addition, will be virtually the same. 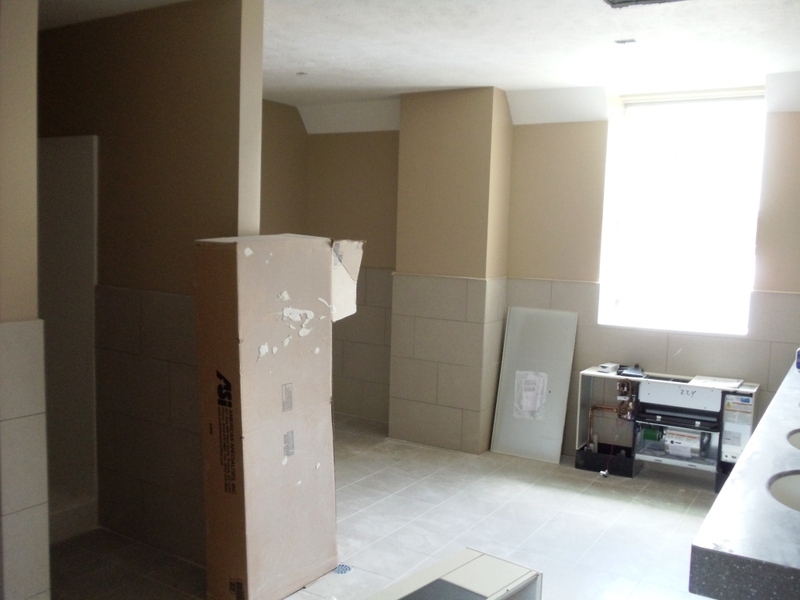 Tile work started in the 2nd and 3rd old bathrooms, ceilings are done and painters should move in next week to start painting walls on the 2nd, 3rd, and 4th floors of the old side of the chapter house. 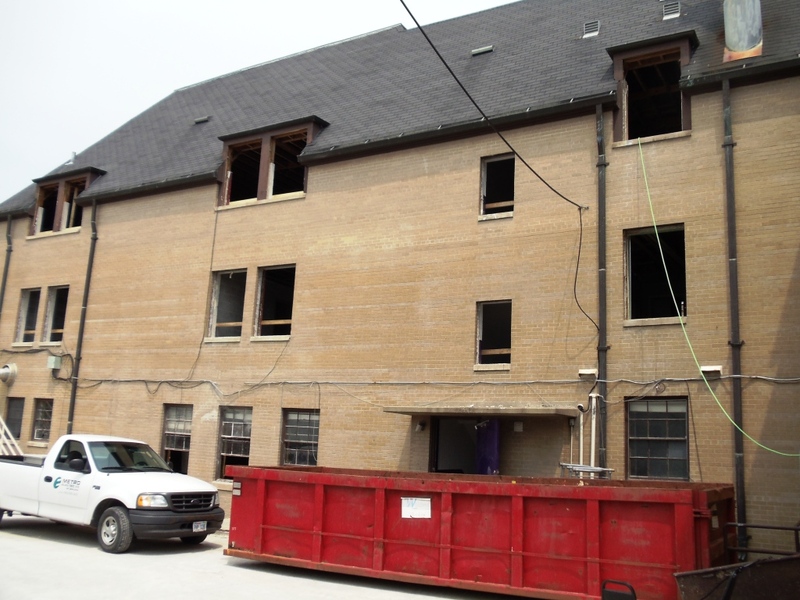 Windows are also scheduled to be installed next week in the 1964 side of the building and the fire escape windows of the 1931 building. 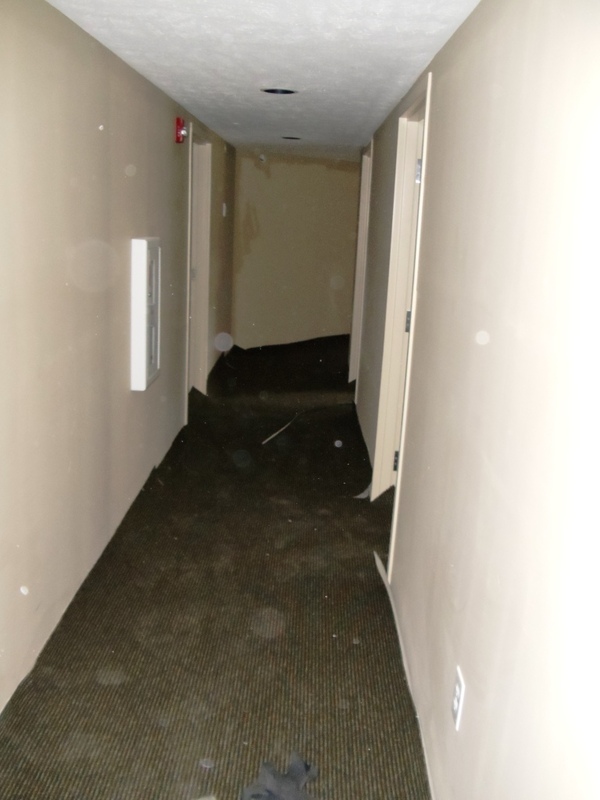 The City of Lincoln will install a new water line to the building tomorrow for the fire sprinkler system. 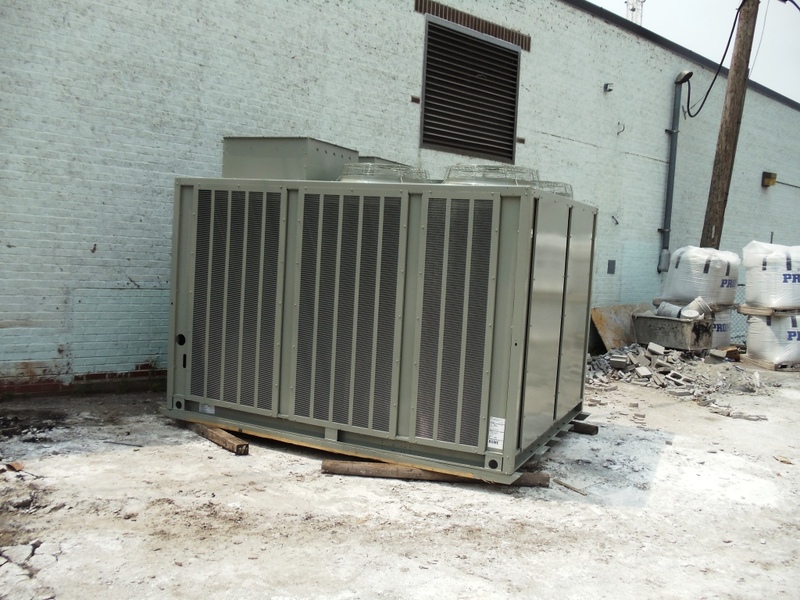 The air conditioner compressor unit has arrived. 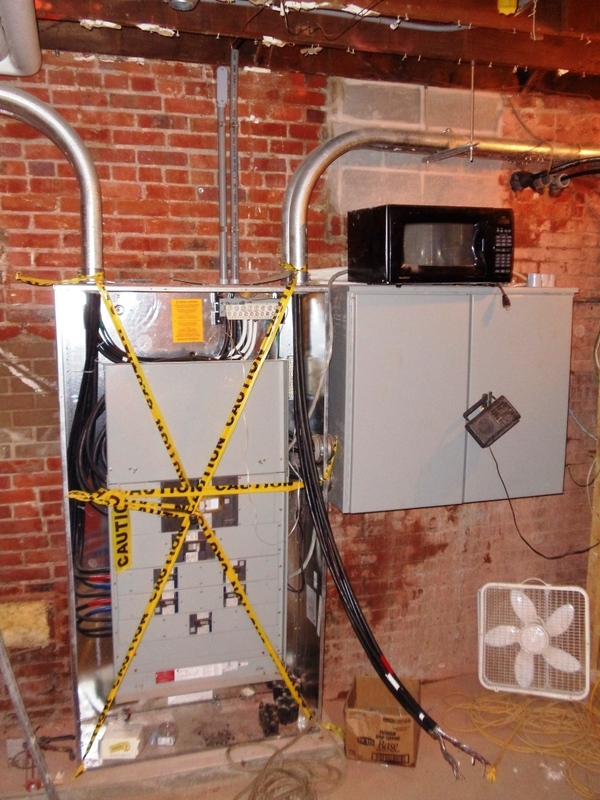 The 1964 chiller equipment was removed as part of this project. The old chiller has not worked for at least 20 years. 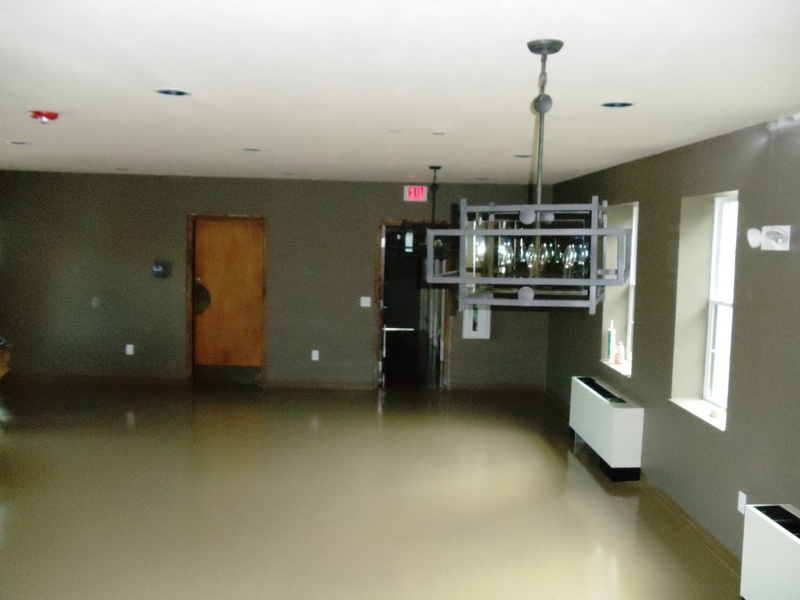 The chiller room, located under the kitchen, will be used for storage. 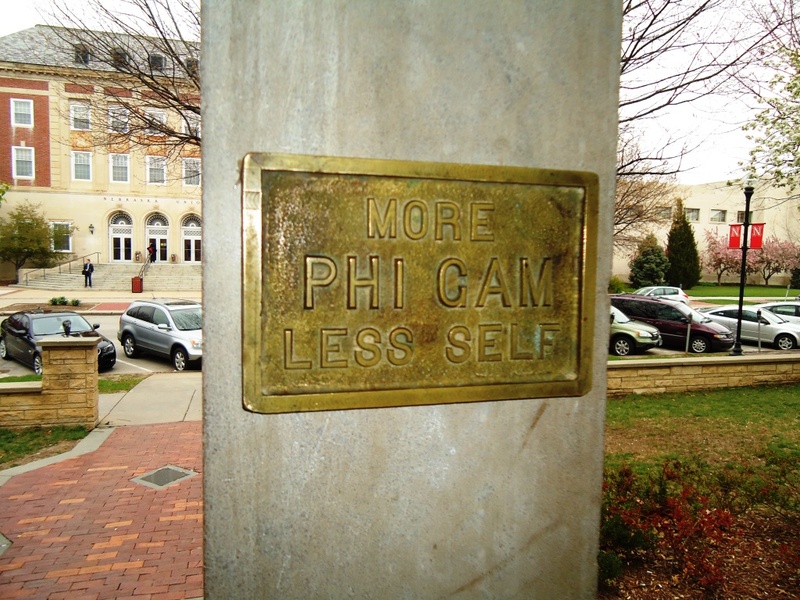 Special thanks to Walter Gerlach (Nebraska 1958) for helping solve the mystery of the brass “More Phi Gam, Less Self” plaque that was found during demolition last February. Brother Gerlach made two of these plaques (one for each door of the second and third floor bathroom) in foundry located in the basement of Richards Hall. One of the plaques has been mounted to an exterior column for the Undergraduate Brothers to see as they leave the house and to remind them of this fraternity creed. Thank you again Brother Gerlach for helping solve this mystery. Windows will be installed next week on the 1964 addition. Living room ceiling has been installed and will be finished next week. Patch work will need to be done in the kitchen. 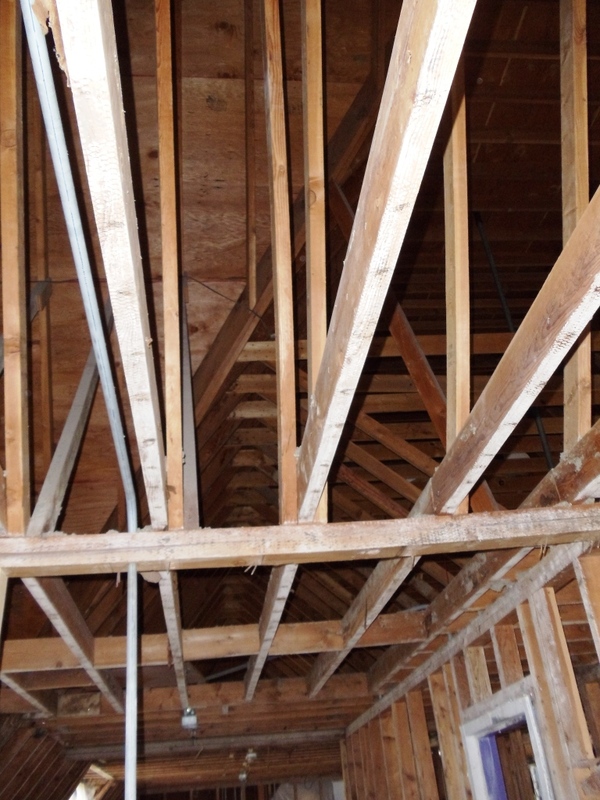 Thankfully, the entire ceiling did not need to come down, just select areas to gain access to the heating system. 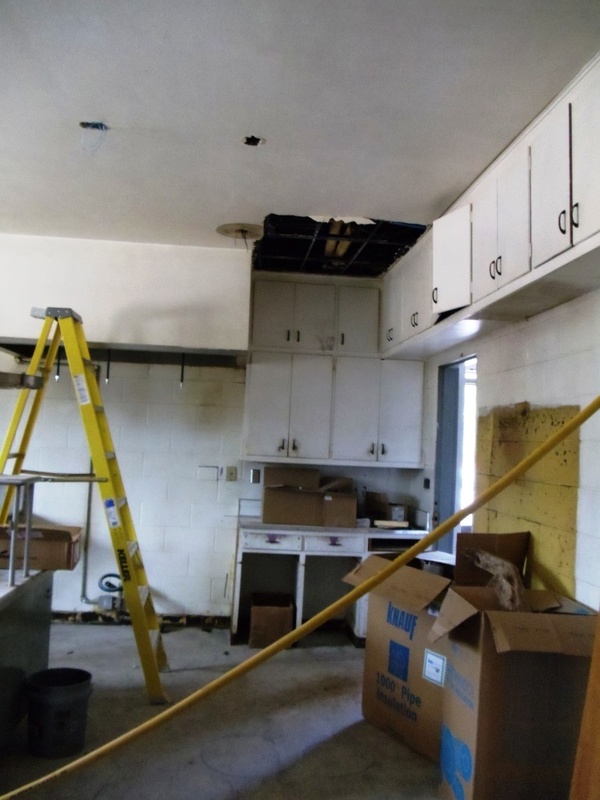 The kitchen will also receive new appliances. If anyone wants to buy the old fridge (heck, if you want to get it out of there) drop the house corporation an email. It works fine, however, the bottom is starting to rust away. Study area of room 200. The ceiling is done. Room 210’s (formerly room 212) study area. This room has two sleeping rooms of this shared area. 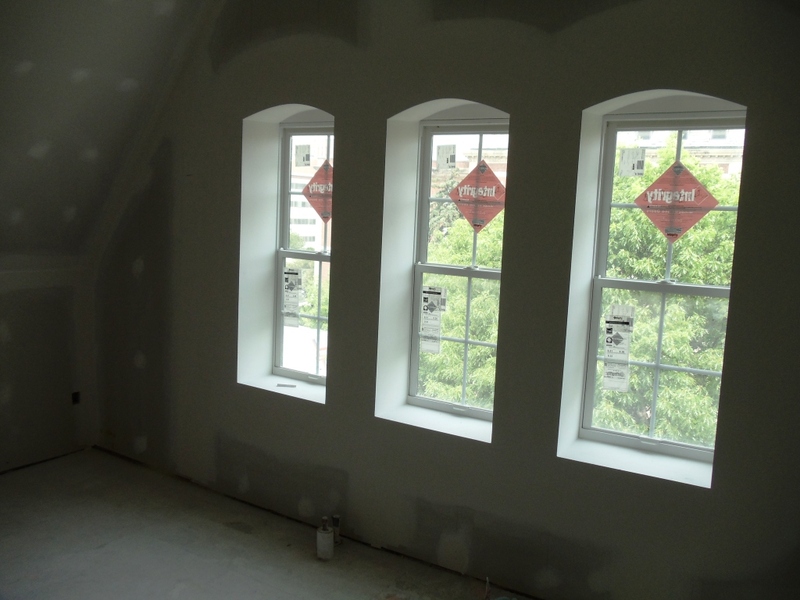 New windows in room 400 (formerly known as 4-North). The study area of room 401 (formerly 4-South). This is looking at the south wall of the chapter house. Walls are going up in the new basement study room (formerly B1). The old stairs will blocked off. 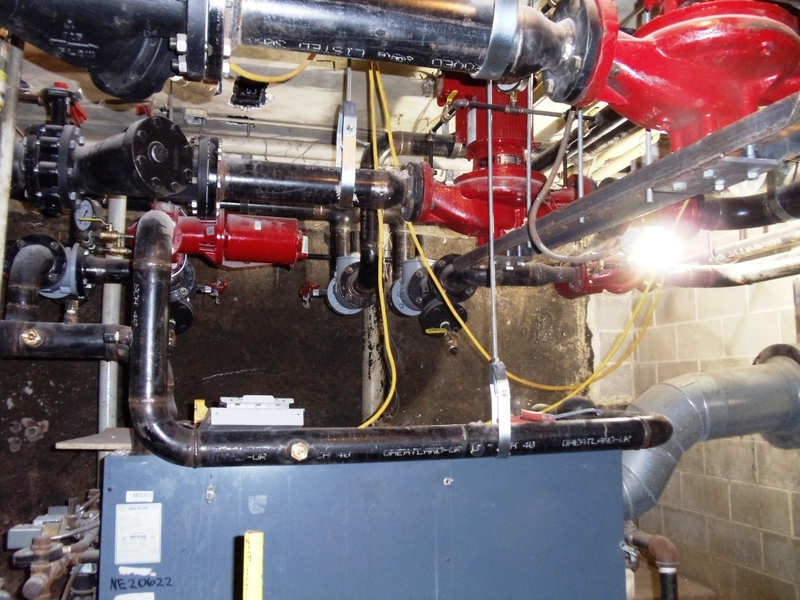 All kinds of new pipes and pumps in the boiler room. And, the new air condition compressor unit. This will be installed in the next few weeks. 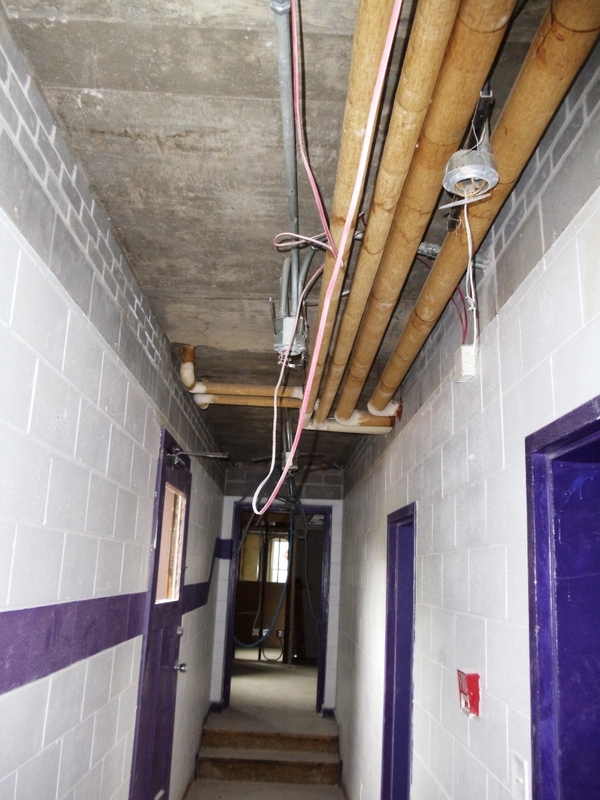 The demo and asbestos crews have been busy – the first floor foyer, dining room, and hallway ceilings have been taken down. 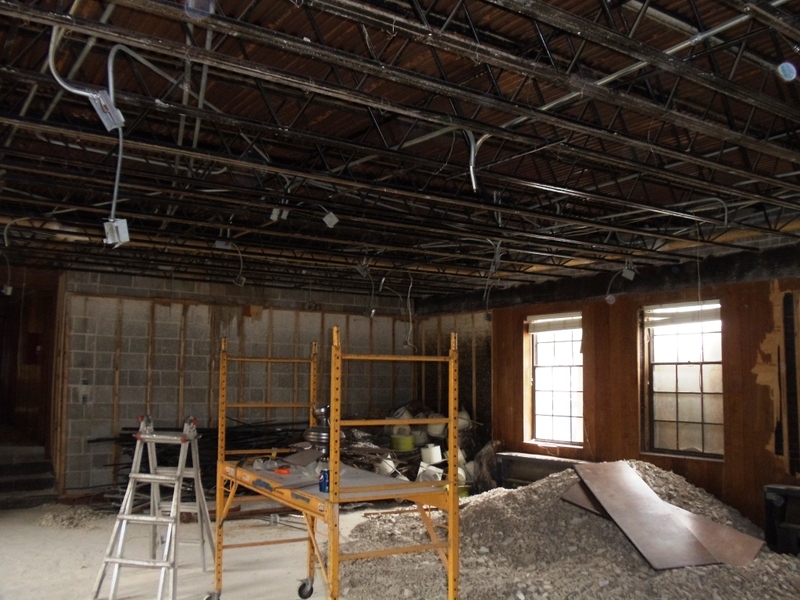 The second and third floor walls have been taken down in the 1964 addition. 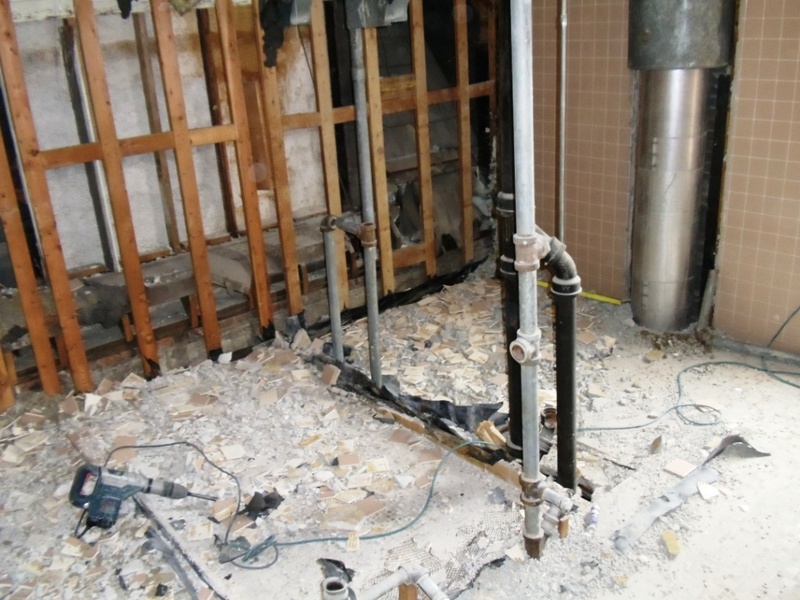 Demo has started in both bathrooms and should be finished next week. Work continues in the 1931 building. 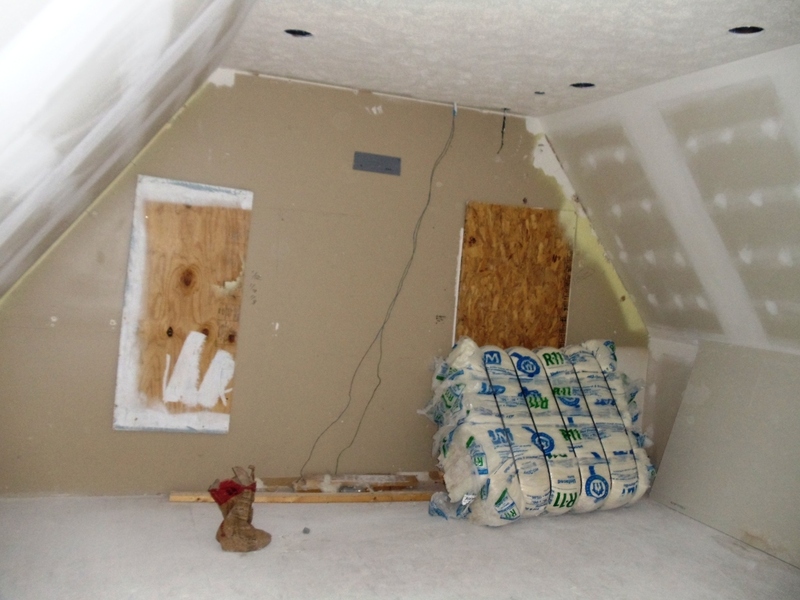 Insulation is being installed on exterior and interior walls. This will help with both energy efficiency and sound. 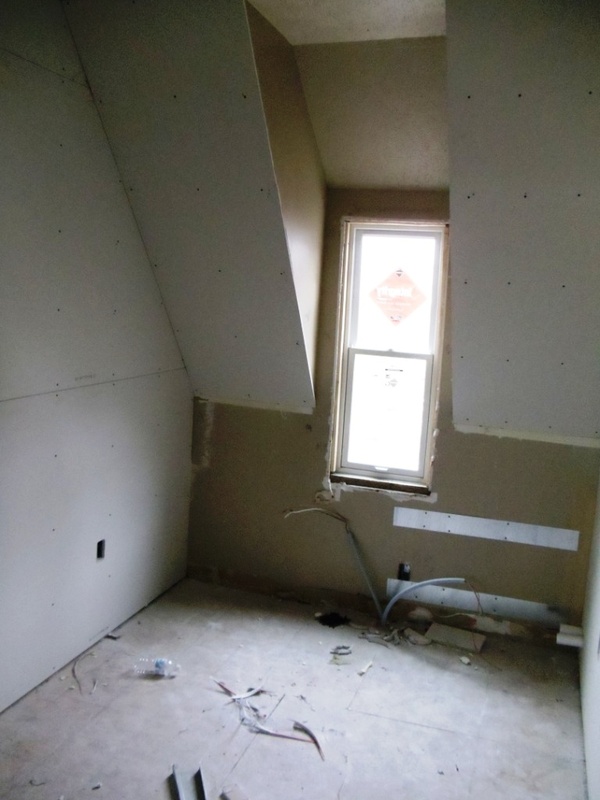 Drywall and insulation has been installed on the fourth and third floors, including the third old bathroom. 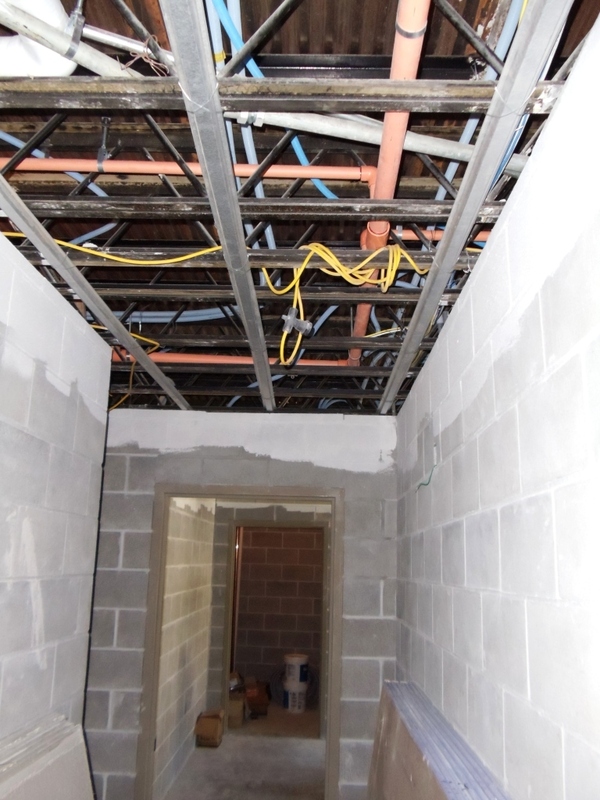 The mason is building the new egress doors on second, third and fourth floors. Next week the masons will start laying the walls on second and third floors of the 1964 building. 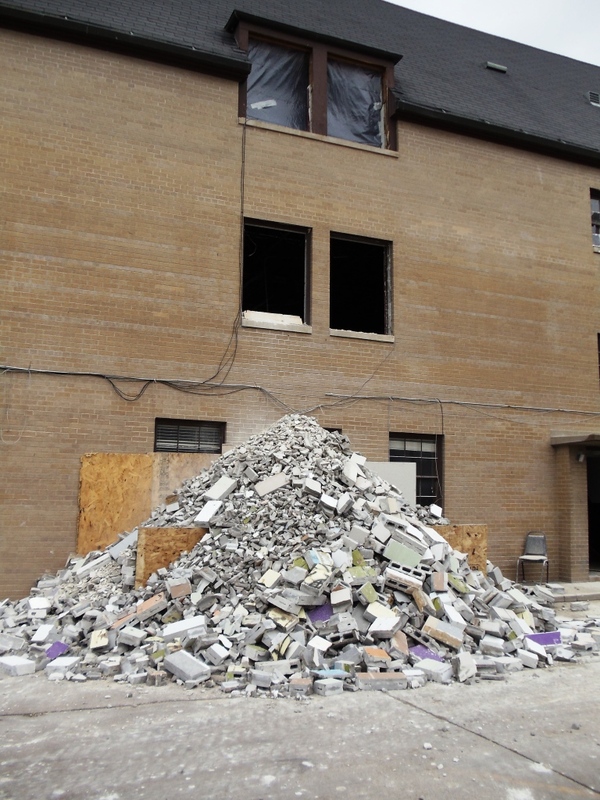 Cinder blocks will be used which will help with longer term maintenance of the building (no more broken drywall). If you would like to see the house in person, the House Corporation is hosting a breakfast next Thursday, May 26 at the chapter house. The breakfast is from 7 to 9 a.m., with a short campaign update at 8 a.m. Please send an email if you plan to attend. The cost if a suggested donation of $10. Dining room, taken from the northwest corner looking towards the east. The told tile has been removed in the kitchen. While the layout is not going to change, new appliances will be installed. 2nd new — taken from the northeast corner of what was the cleaning closet — looking towards the west. 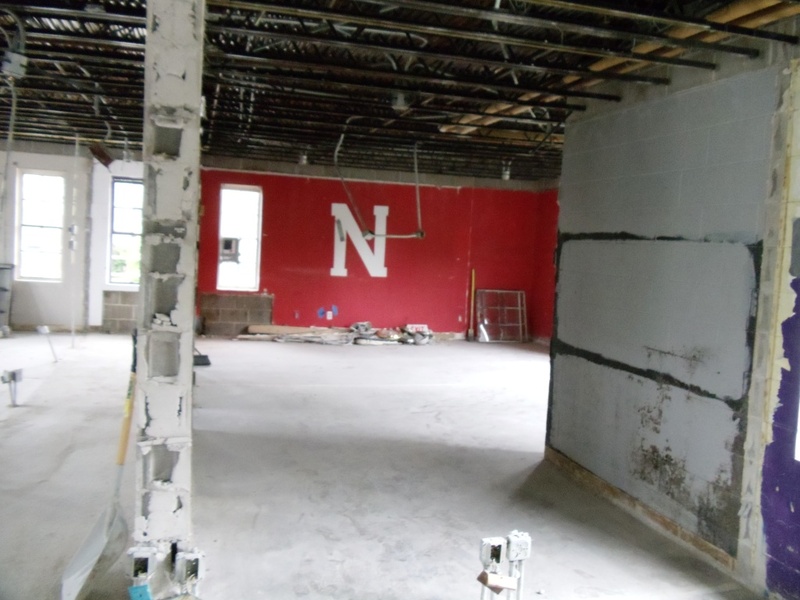 The red wall on the right was room 206 and the red wall with the Husker N was room 210. 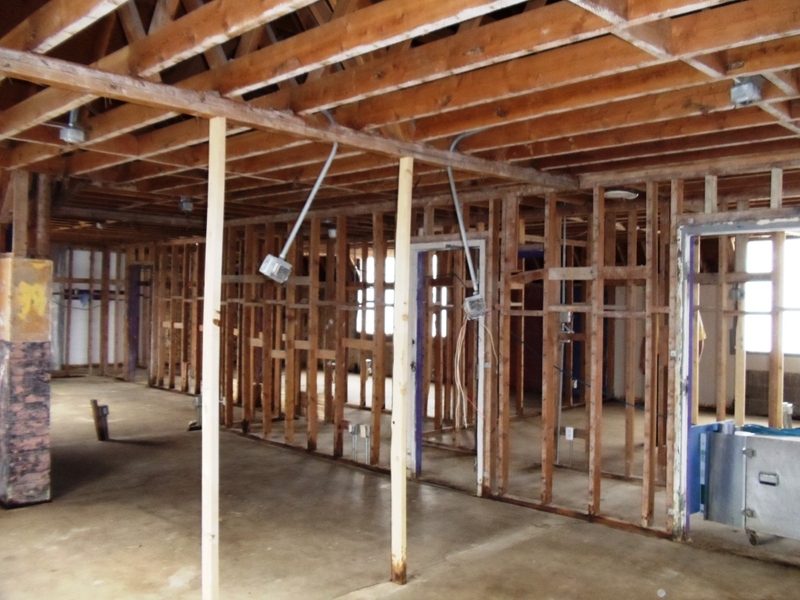 The cinder block wall in the middle of the photo is a load bearing wall and can not be removed. It was the south wall of room 210 and 211. Hallway outside the balcony and 2nd new bathroom. The ceiling has been removed. 2nd floor — taken from the southeast corner of room 206 looking to the west. The purple wall was room 212. Taken from the northwest corner of room 210 looking into room 211 and 212. Standing in room 212, looking into the bedroom area of room 211 and 210 (the red wall). Old side of the house — 2nd floor — this is where the window for the fire escape was located. 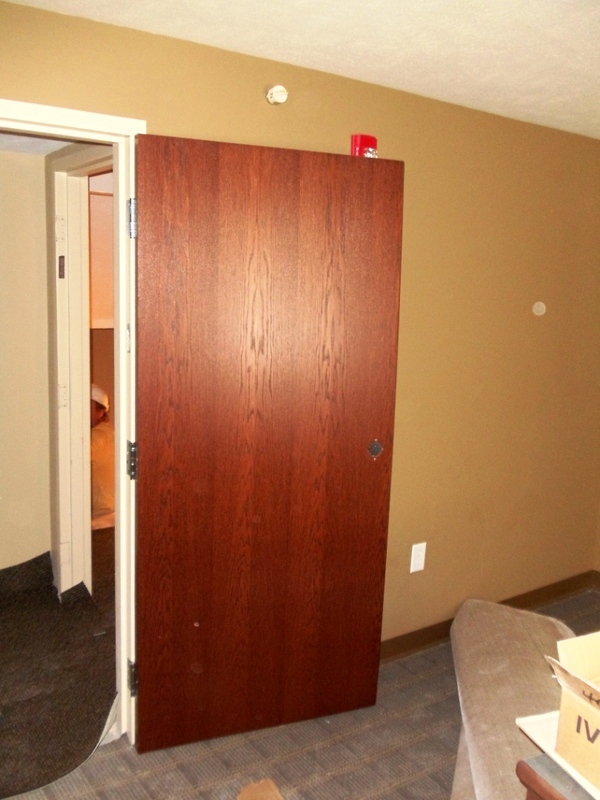 Code required a door be installed. Southwest corner of 3rd floor (room 309) looking east. The walls will be removed after the cinder blocks are stalled to hold up the roof. Taken from room 310 – northwest corner looking into room 211 and 212. A detail of the roof structure of the 1964 addition. 3rd new bathroom — shower and toilet area. 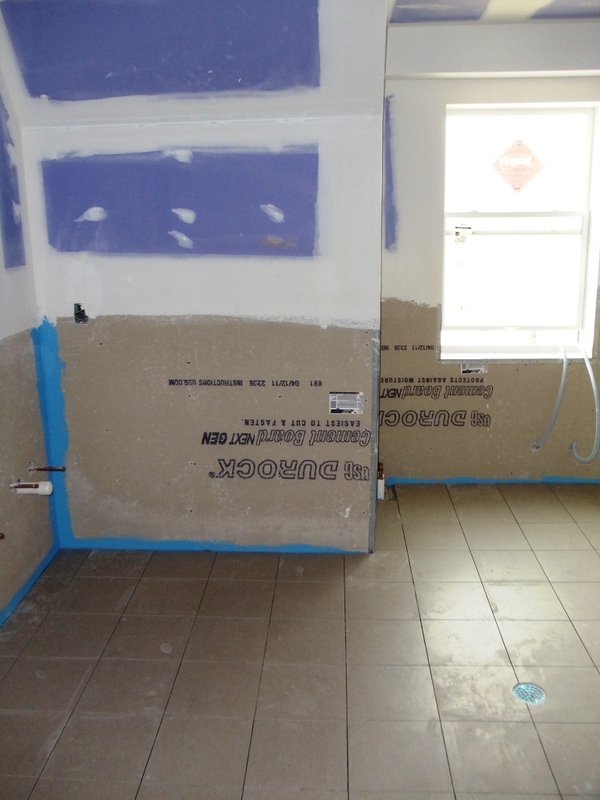 Drywall in 3rd old bathroom looking at the area were the sinks will be installed. This was the area where the showers were located. 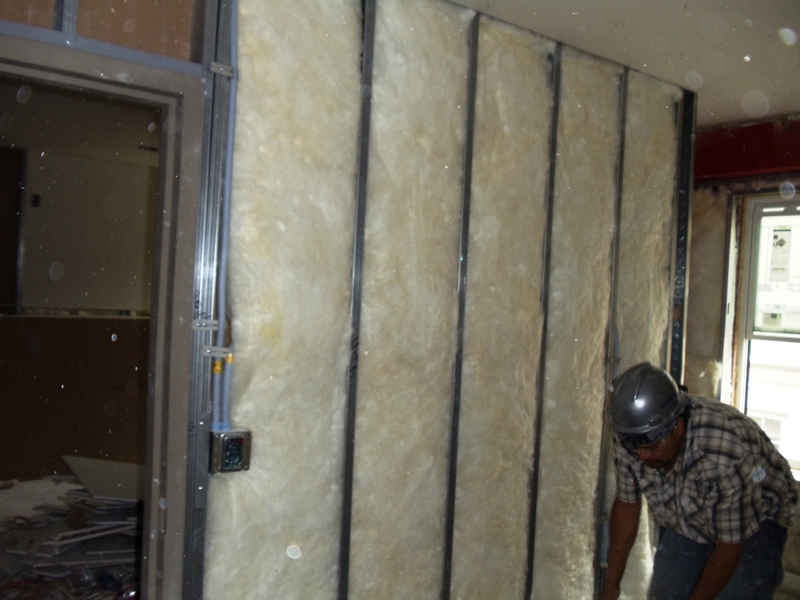 Interior insulation being installed in the new room 300 (approximate location is where the old room 301). 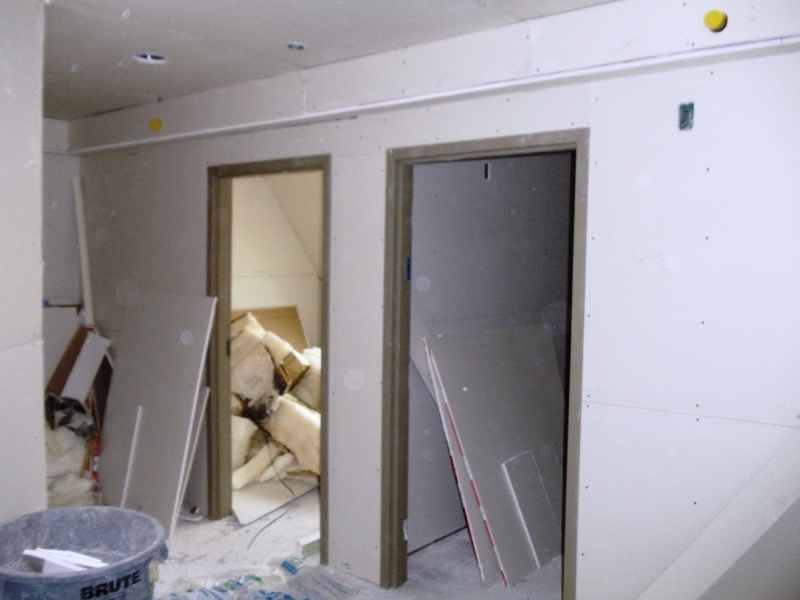 Drywall installed in the new room 301 (old 302). Standing in the educational/study area looking into the sleeping rooms. These will both be private rooms. Room 400.b — old 4South. This will be a bedroom for two brothers. 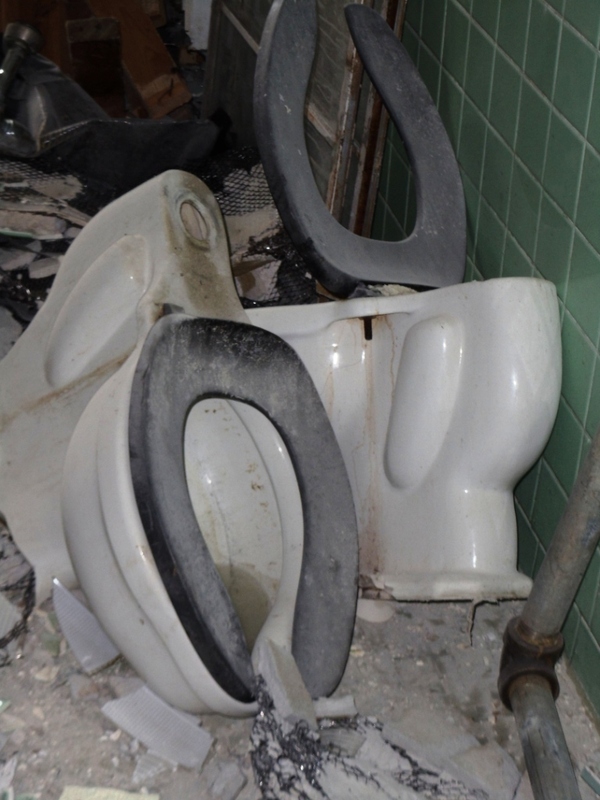 Goodbye 2nd new toilets — I think we’ve all cleaned these at one time or another. Read how to support the project by clicking on the “How to Donate” tab at the top of the screen.